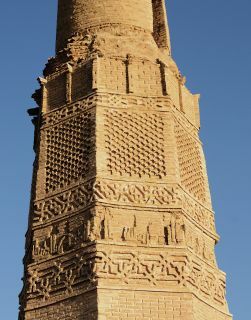 The minaret is made of brick. It is slightly different from other Seljuk minarets in lran. 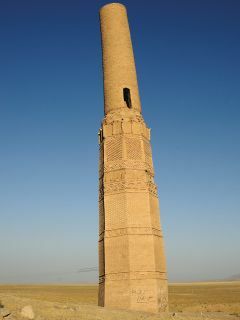 The minaret consists of two sections. The first section rises above a decagonal base. This section is divided into four thin horizontal borders and five wide borders. There are geometric patterns under the balcony. The second section of the body is cylindrical, and undecorated. There is only one door allowing access to the balcony. The decagonal body was divided into small pilfars, with two recesses on each face. The minaret balcony is built over wooden supports. Only a few traces of these supports remain. 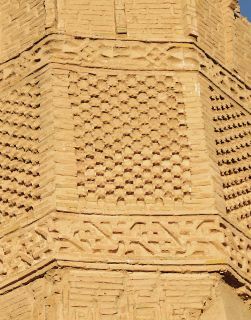 There is an inscription between two geometric grids over the octagonal body, which reads: ''Bismillah, this minaret is ordered ta be built by Sheikh .... "
According ta the style of the inscription, it is believed that the construction was ordered by a Shiite woman in Kashan in or around the year 1106. There is na traces of other structures around the building. Due to its location next ta the road, it has been suggested that the minaret may have been used as a guide far passing caravans.